Sipna river which is also termed as “Sipna Mata” is a source of life & hope for Melgath. Sipna originates in Melgath & meets Tapi River in Melgath itself. From last three years Sampoorna Bamboo kendra (SBK) is organizing public event to walk around Sipna with experts studying six resources connected to Mother Sipna, which are her ; Jungles, Land, Water, Tribes, Animals & Sky. 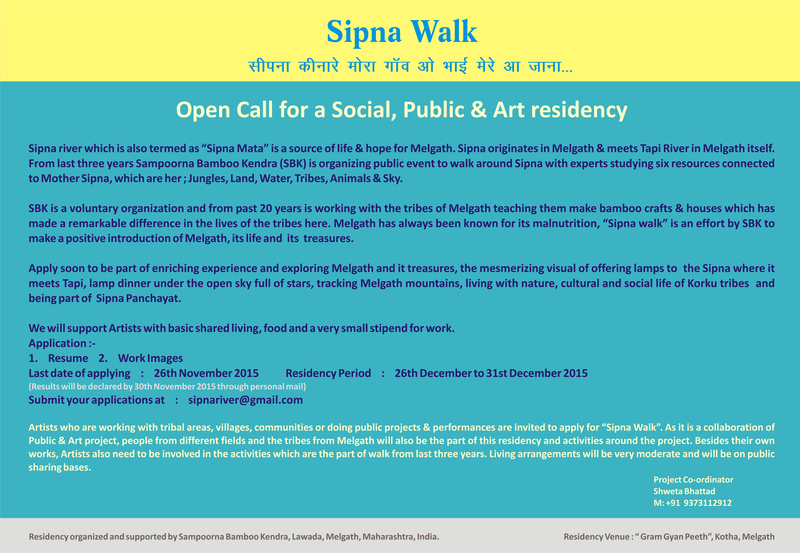 Artists who are working in tribal areas, villages, communities or doing public projects & performances are invited to apply for “Sipna Walk”. As it is a collaboration of Public & Art project, people from different fields and the tribes from Melgath will also be the part of this residency.